Children should do chores, right? It is important for them to know they contribute to the family plus it teaches important life skills. And of course, I get awfully tired of doing it all myself. We don't do any kind of chore charts these days. I tend to just nab any child who isn't actively doing homework when a job needs doing. Not surprisingly this system leads to a lot of suddenly remembered homework. Which is great because if said child was just goofing off prior to being nabbed there is obviously plenty of time for him (or her) to do the chore and then start on the homework that I am now aware needs doing. Yesterday, Imagination Boy unloaded the dishwasher. I was sitting at the table reading the newspaper (one of my important daily chores). I glanced up and saw an amazing sight. The dishwasher was empty and IB had the final dish in his hands and was opening all the cupboards looking for the proper place to put it. I nearly had to choke back a sob. 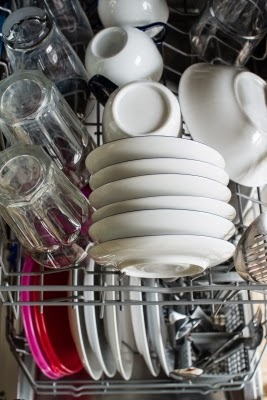 For years, IB would declare himself finished with the job of unloading the dishwasher and I would find it still half full of dishes. "Those are the ones I don't know where they go or I can't reach to put them away" he would say. Over the years, the phrase got shortened. "Have you finished unloading the dishwasher," I would say. "All but don't know, can't reach," he would reply. The most annoying part of this is that usually Music Girl would be tasked with loading after IB had unloaded. Rather than put away the clean dishes left behind or even alerting me to the situation, she usually just added dirty dishes to the clean. But yesterday, yesterday my little boy not only was tall enough to reach any dish location in the kitchen, but he even took initiative to look for the proper place to put a dish he wasn't sure about.